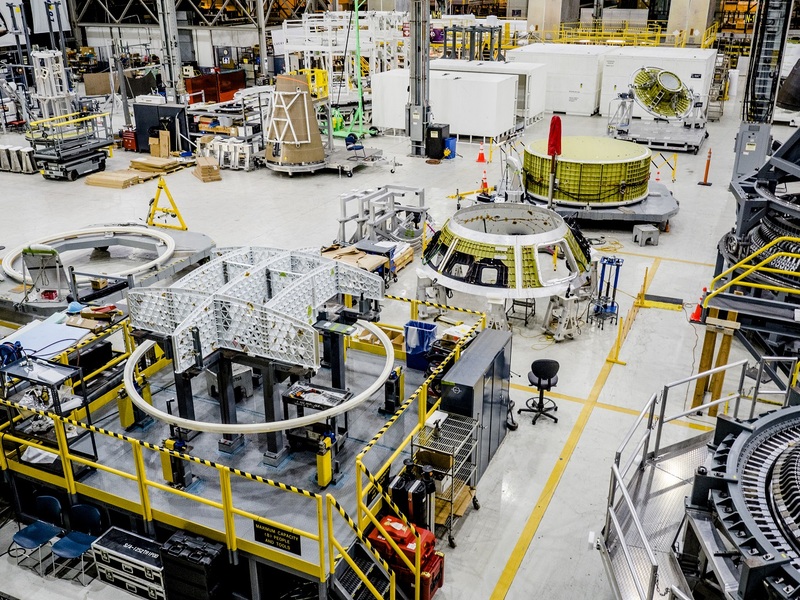 The crew compartment for NASA’s first crewed Orion spacecraft is headed to its launch site in Florida this week after completion of structural assembly at the Michoud Assembly Facility (MAF) in New Orleans. 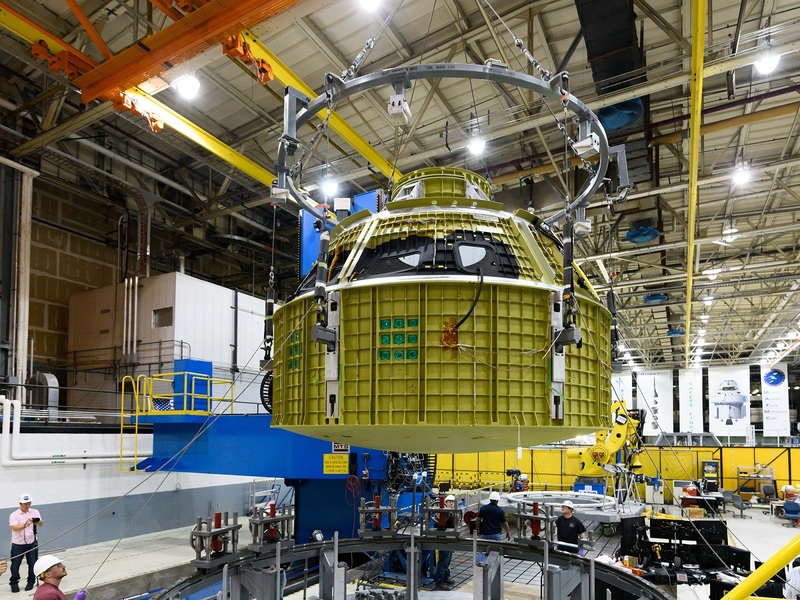 Late last month Orion prime contractor Lockheed Martin completed welding the crew module pressure vessel that will fly on Exploration Mission-2 (EM-2), the first full-up iteration of the spacecraft that will support astronaut crews on multi-week missions to the Moon and beyond. This pressure vessel is the fifth article completed at MAF since 2010 and the design and manufacturing processes have matured together. Welding of the structure was completed on-time to a schedule set more than a year ago. EM-2 will be a test flight for Orion and will see the spacecraft and a crew of four launch on a Space Launch System (SLS) booster. After launch, Orion and crew will first make a high Earth orbit to checkout the spacecraft’s life support systems and then leave Earth to circumnavigate the Moon. The pressure vessel is the crew compartment of the Orion, where flight crews will live and operate the spacecraft on flights from the Earth to cislunar space and back. The seventh and final major structural weld, called the closeout weld, was completed in late July. Self-reacting friction stir welding is used for each of the welds, which have their own special tooling to ensure the parts stay precisely aligned while they are welded together. Assembly of the pressure vessel began late last year, following delivery of the parts from suppliers around the country. EM-2 pressure vessel is lifted out of the welding tool in late July, following completion of the closeout weld. Credit: NASA. The EM-2 pressure vessel is the fifth article assembled at MAF, following the Ground Test Article (GTA) pressure vessel completed in mid-2010 and articles for the Exploration Flight Test-1 (EFT-1) test flight in mid-2012, EM-1 in early 2016, and the structural test article (STA) in late 2016. 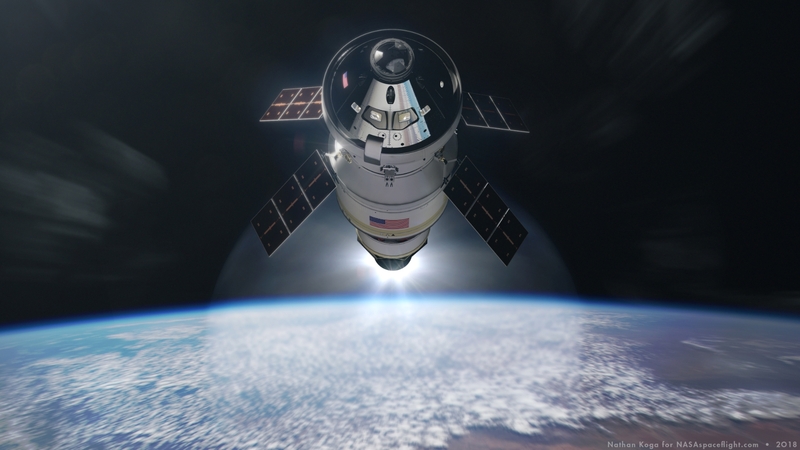 “In the early ones, we had a couple of errors here and there and we’d have to fix them, but on the last several builds it’s been perfect and this one I don’t think we have a weld flaw anywhere that we’ve had to repair,” Scott Wilson, NASA’s Production Operations Manager for the Orion Program, said in an interview at MAF. The seven major structural pieces were first welded into forward and aft sections. The tunnel, forward bulkhead, and the three cone panels formed the forward assembly while the aft bulkhead was welded to the barrel. The aft assembly was completed with fitting of the backbone assembly inside. Elements of the Orion Structural Test Article (STA) pressure vessel at MAF in August, 2016. The white backbone assembly is in the foreground, followed by the three-panel cone, the inverted aft bulkhead and barrel, and the tunnel and forward bulkhead in the back. Credit: NASA/Radislav Sinyak. The backbone is a nine-piece bolted assembly of criss-crossing beams that forms the floor structure that the crew seats attach to at the top. The beams also partition the below-floor space for elements such as crew stowage lockers, the galley, and the toilet. The backbone also provides additional structural support for the crew module. Those two major pieces of the pressure vessel were then brought together for the closeout weld, where the bottom of the cone panels was welded to the top of the barrel. NASA Administrator Jim Bridenstine, right, and NASA Orion Program Manager Mark Kirasich, left, look into the side hatchway of the completed EM-2 pressure vessel at MAF on August 13. Credit: Philip Sloss for NSF/L2. The touch-up of light-green colored primer that covers the surfaces of the aluminum alloy structure to prevent corrosion is also painted on the weld lands. Wilson noted that in addition to the improving quality of the delivered units from one build to the next, the manufacturing is improving in other ways. “The other place, you know as a manufacturing manager, is the time to build it and the cost to build it,” he said. “[On] the first one we tried to do a closeout weld, it took us months, and we struggled to get things right and learn how to make the tooling just right, but part of that is why you do early flights. At the beginning we were making sort of radical changes to tooling to dial it in and in the last couple it’s just been real fine tuning, which means the team here has really done a fantastic job. “So it saves not just cost and time, but then the defect rate is down, too,” Wilson added. Presentation slide showing some of the differences in the crew module structure (of which the pressure vessel is a subset) that were made between the EFT-1 build and the EM-1 build. Credit: NASA, Lockheed Martin. 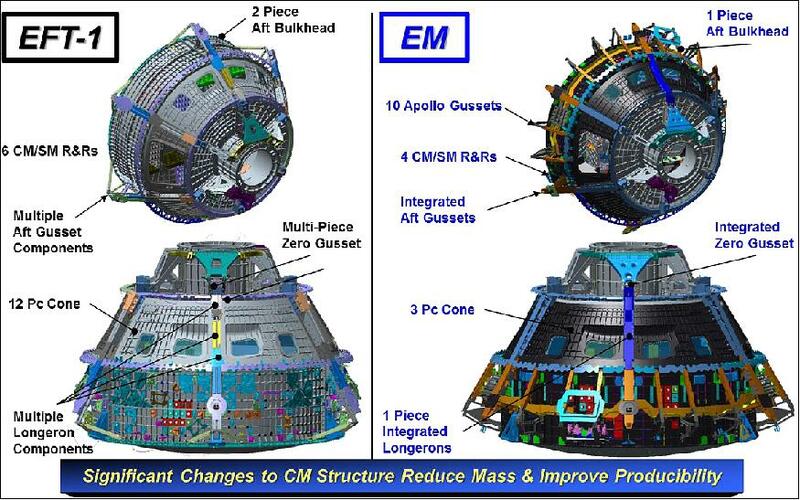 The design of the crew module structure, including the pressure vessel, evolved primarily between the EFT-1 build and the EM-1 build. “When you think of the pressure vessel today, it’s kind of neat because that first one had thirty-one different piece parts and all of those had to be welded together,” Wilson noted. EM-2 pressure vessel, left, and EM-1 spacecraft adapter cone, right, at MAF on August 13. Credit: Philip Sloss for NSF/L2. The current plan is for the heavily packaged article to leave MAF around the end of the week. Once at Kennedy, outfitting the rest of the crew module structure around the pressure vessel will begin. “It’ll go into the birdcage tool,” he explained. 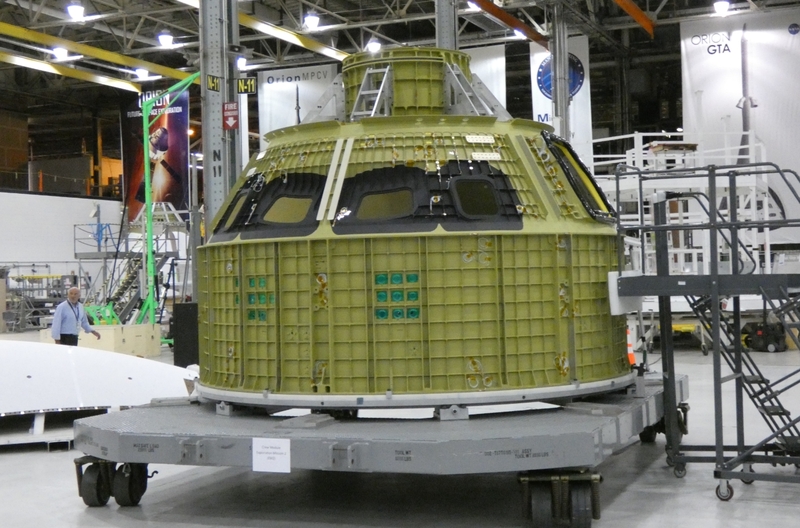 EFT-1 Orion pressure vessel in the birdcage at KSC in 2012. Credit: NASA/Charisse Nahser. 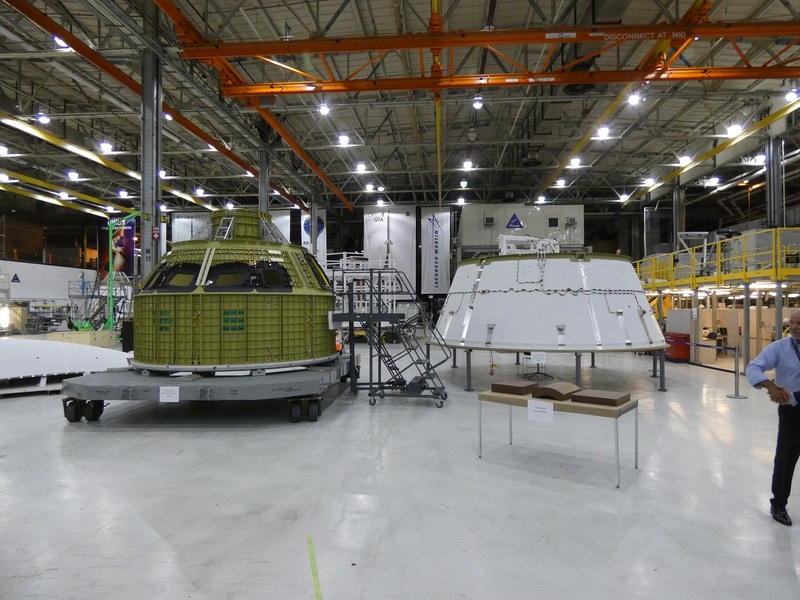 EM-2 will be the first Orion fully-configured to support crewed missions, adding the complement of Environmental Control and Life Support Systems (ECLSS) to the spacecraft to support a four-person crew for twenty-one days. Given its first-flight nature, EM-2 is a test flight that will stay closer to Earth at the beginning of the mission to as a risk-reduction method. Following insertion into low Earth orbit on SLS, the booster’s upper stage will fire again to place Orion in a high Earth orbit that will take 24 hours to complete. That keeps open faster abort options while also allowing the program and flight control team to evaluate the performance of Orion overall and its ECLSS equipment in particular through a full crew day. If everything checks out, Orion will then fire its main engine to do a Trans-Lunar Injection (TLI) burn that takes the spacecraft and crew on a flyby of the Moon before returning home. The mission is currently one of two possible options that NASA could choose for the second SLS launch in 2022, the other being the Europa Clipper spacecraft that will study the Jovian moon. 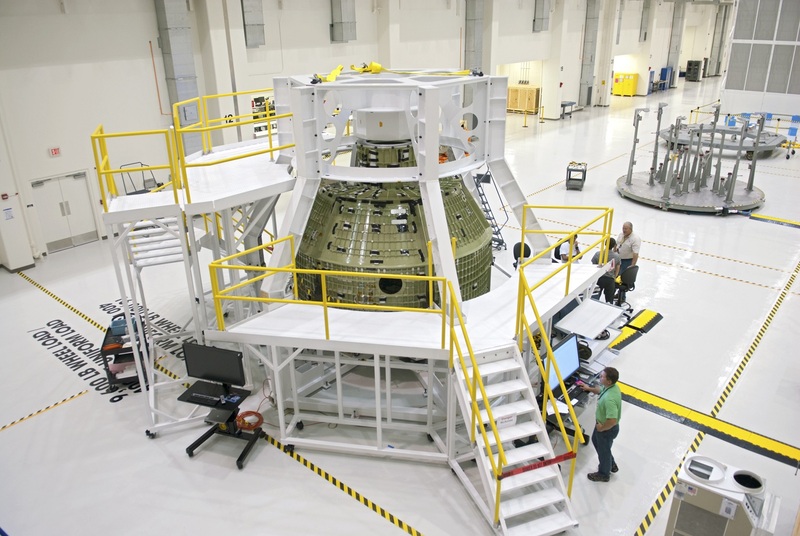 SLS Interim Cryogenic Propulsion Stage (ICPS) fires to help carry Orion away from Earth. Credit: Nathan Koga for NSF/L2. NASA is mandated by law to launch Europa Clipper on SLS as soon as June, 2022. The progress of development and production of both spacecraft and of the launch vehicle will be a big factor in the timing and sequence of the two launches. The launch vehicle for Europa Clipper has not formally been assigned yet, and Orion and EM-2 would take the second SLS launch assignment if another booster is chosen to launch the planetary spacecraft. In addition to the completed EM-2 pressure vessel, hardware for two other upcoming Orion test flights is being processed at MAF. 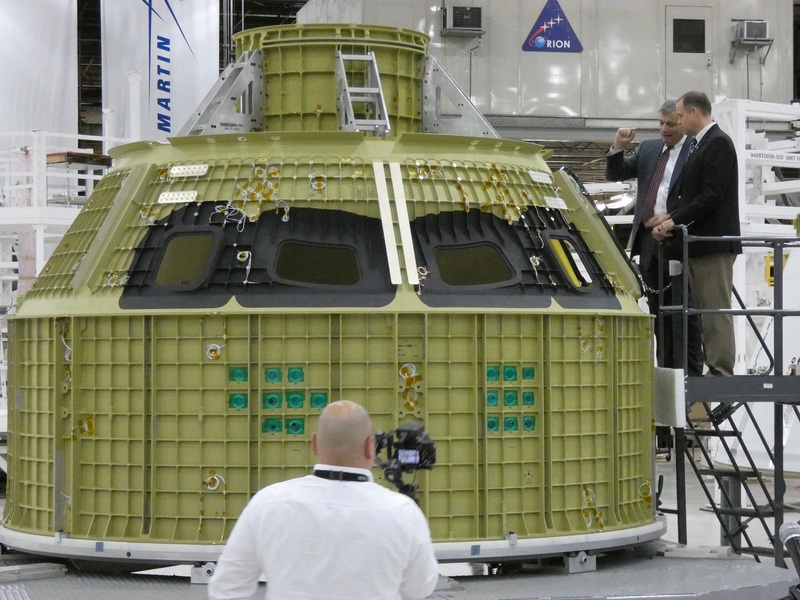 NASA Administrator Jim Bridenstine was taken on a tour of the facility on August 13, and during a presentation to the media in the Orion work area there, NASA and Lockheed Martin displayed several items. Next to the EM-2 pressure vessel was the spacecraft adapter cone for EM-1. The adapter connects the spacecraft to the launch vehicle (via another adapter) and is a spacer to provide room for the length of Orion’s main engine nozzle. Composite of two NASA diagrams showing the relative location of the Orion spacecraft adapter cone to the spacecraft (left) and the launch vehicle stack (right). Credit: NASA. A Spacecraft Adapter Jettisoned (SAJ) panel and a LAS ogive panel for EM-1 were also on display during the presentation. In the back of the area, the primary Launch Abort System (LAS) structure for the Ascent Abort-2 (AA-2) test scheduled for next April was being processed for shipment to KSC. That test will fly from Pad 46 at the nearby Cape Canaveral Air Force Station (CCAFS). The structures at MAF will mate at the top to the series of three solid rocket motors that will pull a boilerplate Orion crew module away from a test booster, steer it to the right attitude, and then separate from the crew module.